Boo! Want to learn how to make this creepy - and dare I say it?! - realistic spider, to decorate a picture frame? It's not hard at all, trust me... step-by-step instructions make it a project you can complete in an evening. Quilling tool - needle tool or slotted tool, whichever you prefer. 1. Body: Roll a 24 inch strip of black paper on quilling tool. Glue torn end (a torn edge blends best) and slide this tight coil off tool. Use the end of tool or a fingertip to press against one side of the coil to give it a rounded shape. Pinch this domed coil between thumb and index finger to form an oval. Apply glue to underside to preserve curve. 2. Head: Roll a 10 inch strip and proceed as for body, making a domed tight coil. Glue head to body. 3. Legs: Make 4 pairs of legs - two short pairs (4 loops) and two long pairs (7 loops). a. Begin by making a 1/8 inch fold at one end of a black strip. b. Make a loose loop around the fold, larger than the first loop, encircling it. c. Holding loops at bottom, continue wrapping strip to create more loops, making each one about 1/8 inch taller than the previous loop. d. Glue strip at bottom and cut off any excess. e. Hold at glue join and slide thumb and index finger of opposite hand along sides of loops, pinching them to form a narrow 'leg' column. 4. Eyes: (make 2) Make a 2 inch black, domed tight coil. Pinch into oval shape. Glue on head. 5. Antennae: (make 2) Follow directions as for legs (2 loops). Curve and glue on head between eyes and front legs. 6. Marquise: Cut a 4 inch strip of orange quilling paper lengthwise in half. Roll one of the strips; allow coil to expand, slide it off tool, and glue end. Pinch at two opposite points to make a marquise shape. Center and glue marquise on spider's back. 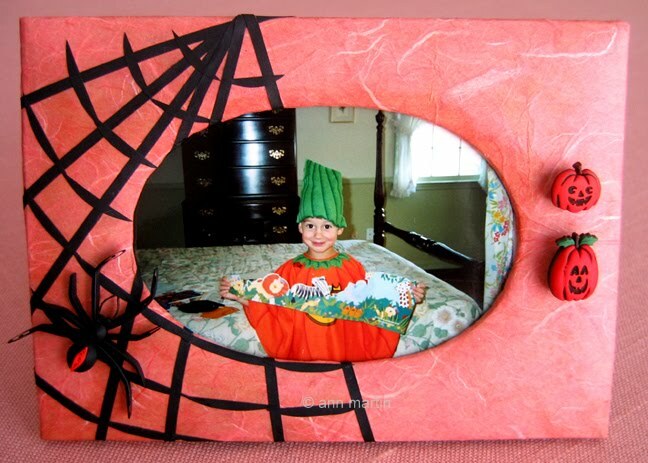 A paper mache frame is inexpensive and can be found at any big box arts and crafts store. To cover it, separate the front from the backing and coat front surface with glue (glue stick is easiest). Next, apply a sheet of orange mulberry paper and fold the corners around to the back as if wrapping a package. For the oval photo area, make a slice through the mulberry paper that covers the oval and trim away all but a half inch of paper that extends beyond the oval margin. Make cuts every inch or so around the oval, perpendicular to the frame, forming tabs. Fold these tabs to the back of the frame front and glue them in place. This gives the edge a finished look. Then glue the two frame parts back together, laying a heavy book or two on top while the glue dries completely. Spider web instructions:The web is made of black quilling strips. For the cross pieces, trim the ends with scissors to give a curved effect. Glue each strip on the frame referring to the picture. Use either liquid glue or a glue stick... this can get a bit messy, so keep a damp cloth handy to wipe your fingers. If you get some glue on the front of the strips, fear not... simply wipe off with the cloth before the glue has a chance to dry completely. Holding spider with tweezers, dip its underside in a glue puddle you've spread on a plastic lid. Place it where desired on the web. Cut shanks off two little pumpkin buttons so they'll lie flat and glue them on the right side of the frame. hi Ann, thanks for the tutorial, the spider is so neat & looks like a real one ! Very lifelike! I know because I'm terrified of spiders and seeing the picture really freaked me out! It would make excellent Halloween jewelry! If youwould like to make more cute quilled insects like the spider frame you should check out one of my favourite books, "Thrilling Quilling" by Elizabeth Moad. The chapter Beautiful Bugs is certainly worth a look! Such a cool spider! I have no quilling stuff or clue how to do it - otherwise I would rush off and make one immediately!